I’ve been working for TetraMap for 3 years now and have never had a ‘normal’ Christmas ‘do’. It’s always involved plenty of fun and games but never your traditional Christmas office party. For that, I am actually quite grateful. For these parties can be a little stressful; organising whose Christmas party to attend, yours or your partners, they normally always clash! Then there’s the childcare arrangements, taxis bookings, drinking too much and so on, I think you get the picture. This year has to be the most alternative yet and I absolutely loved it, why? Because it wasn’t about me, it was about giving back and that really means more these days. I don’t know why but maybe I’ve reached an age when the world around me seems like it needs more help than I do. TetraMap has been involved with the Million Metre Stream Project a couple of times, one donation was a lump sum donated to the project to offset the carbon emissions from our Managing Director’s around the world business trip. The other was our alternative team Christmas party. 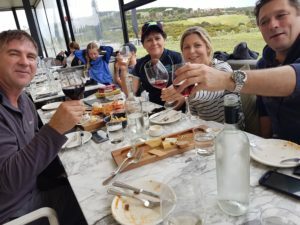 The invite went out to all of the TetraMap team and their family which was a real treat as it’s not often you get to share something like this with your kids and partners. Yes, we do our recycling, reduce and reuse, make donations, as much as we can, but we had never been on a community project together like this. 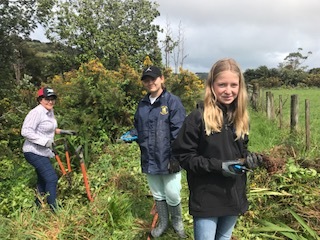 We weeded for four hours on the beautiful island of Waiheke to help protect and restore our wetlands and waterways. Hardly a chore when you think of the beautiful nature we were lucky enough to be surrounded in. First hand my kids and I got to experience what it is like working on a community project and seeing how much of a difference this is making. 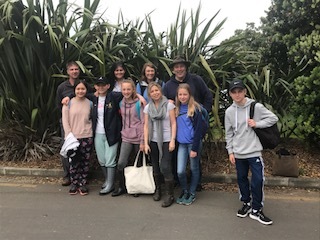 The Project Leader, who drove us to our first restoration site, was incredibly knowledgeable and explained how the restoration of the native wetlands relied solely on volunteers. Every year, they get something like a thousand volunteers to help plant, weed and maintain the waterways. An amazing 20,000 metres of New Zealand waterways have been restored, this far and counting. As a team, although we didn’t get much of a chance to talk, we did get a chance to do something fun together. It was hard work, from all the weeding, but then followed a lovely ‘wine-down’ afterwards at a local vineyard! All in all, an incredibly nice way to spend a few hours with your team. What about your next ‘do’? The next time your boss asks you to think of something different for this years Christmas party think beyond the norm, think giving back! Get in touch with your local sustainability network or community projects and find out what’s going on, they will say yes to more volunteers. 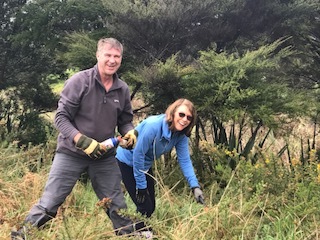 It’s a great way to have some fun and make a positive difference to our environment, which really needs some TLC (tender loving care) right now! I must say what a lovely day and we did make a difference in a day. “Living the values: Laughing and learning together in Nature: Teamwork – Dreamwork! An amazing day, full of fun, whilst working as a team towards something with great purpose.